The ruling Saenuri Party’s new chairman Rep. Lee Jung-hyun on Wednesday kicked off his first public schedule, urging members to fully support President Park Geun-hye’s policy initiatives. “I will concentrate all powers of the party so that this government can bring all imminent issues including the public’s livelihood, economy and security to a direction that the people want,” Lee told reporters after paying tribute at Seoul National Cemetery. It will be the first gathering of Cheong Wa Dae and the Saenuri leadership since the party’s crushing defeat in the April general election. The last meeting between her and the party leader took place on Dec. 7, 2014 when former leader Rep. Kim Moo-sung steered the party. Lee, a third-termer representing a progressive-leaning constituency in Jeolla Province, was elected party leader in a contest between the faction close to President Park and its dissenters. Lee, often viewed as the standard bearer of pro-Park faction, defeated runner-up Rep Joo ho-young by a margin of about 12,000 votes in a party electorate of 69,817. In his acceptance speech, Lee vowed to express himself and deliver the party’s opinion “quickly and accurately” to Cheong Wa Dae, who has been criticized for its lack of efforts to communicate with political parties when pushing for contentious initiatives such as welfare reform. The Saenuri Party’s previous leadership had often suffered from a strained relationship with the presidential office. Most notably, former floor leader Rep. Yoo Seong-min often voiced dissent over the president’s policies, leading him to resign from his positon. Meanwhile, the new leadership is planning to deny the members of the Supreme Council an opportunity to speak during the council meeting broadcasted by media outlets in a move to singularize the party’s message. 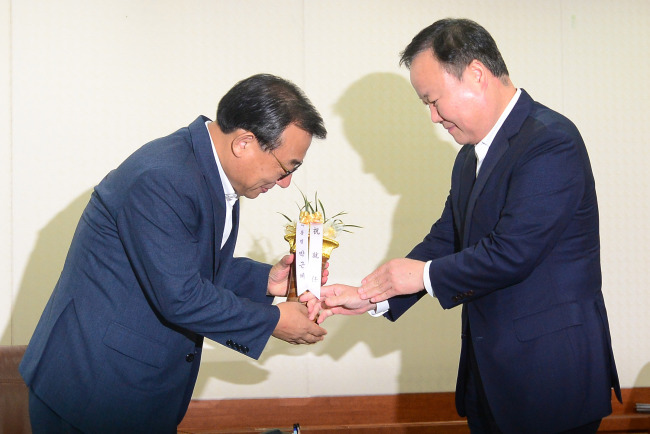 Saenuri Party secretariat Park Myeong-jae said that the party chairman and floor leader would be the only ones to make public remarks. “The plan aims to reveal the party’s coordinated position on the issue where party members are divided,” Park said.